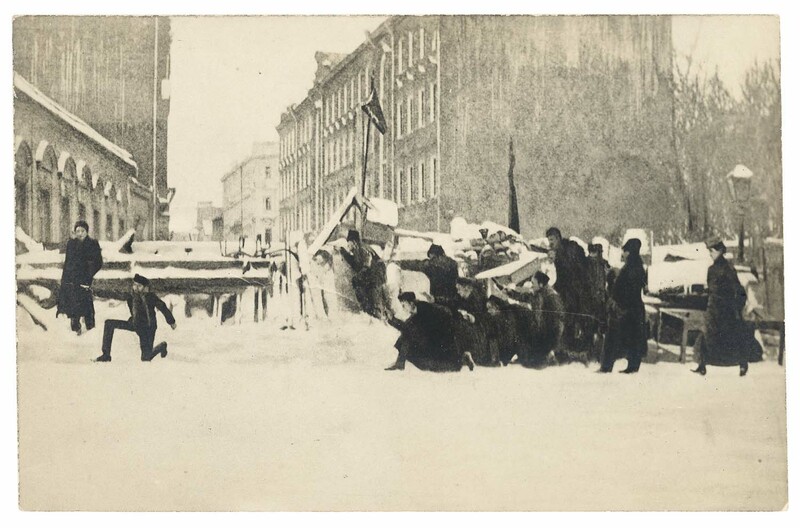 Mathew first became interested in these images, which range from photographs to cartoons, when he started collecting pre-1917 postcards while living in Russia — and his book is full of the beautiful and evocative illustrations. 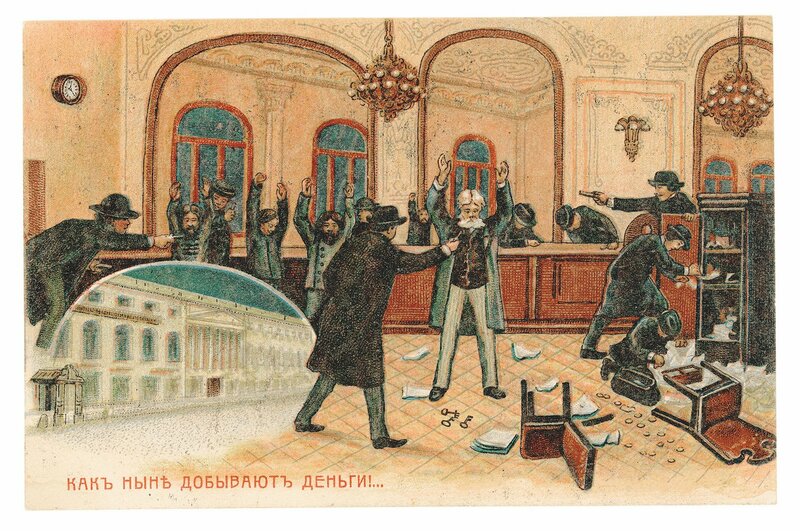 In this edited extract, he describes the hunt and arrest of Mikhail Chemodanov, one of the gifted artists involved in producing postcards during the 1905 revolution. Doctor Mikhail Chemodanov was one of Russia’s leading dental practitioners, regularly attending to the needs of the Moscow elite. 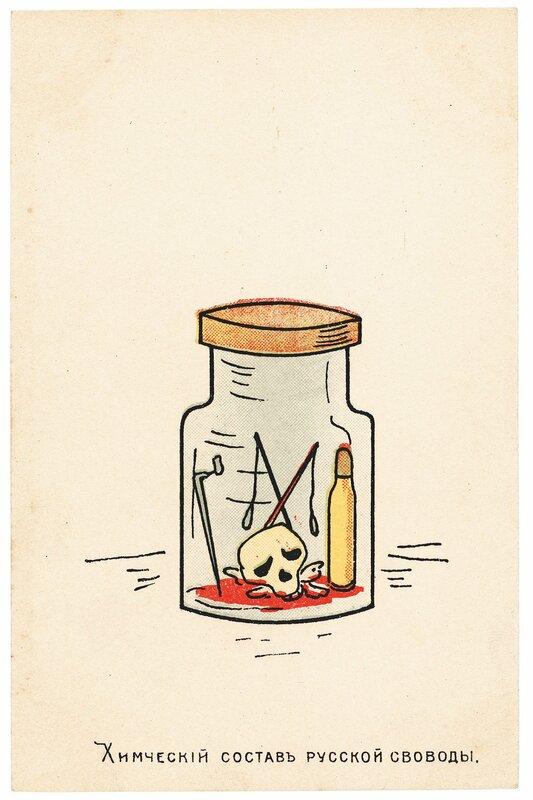 But behind the façade of a respected medical professional, he had long nursed a hatred of autocracy. He was no fanatical idealist, but a compassionate and kindly man who had seen the injustices and deprivation of the Russian Empire at first hand. He also happened to be a gifted caricaturist. Sometime in mid-1905, Chemodanov was introduced to Dmitrii Peschansky, the owner of a photographic studio in central Moscow. 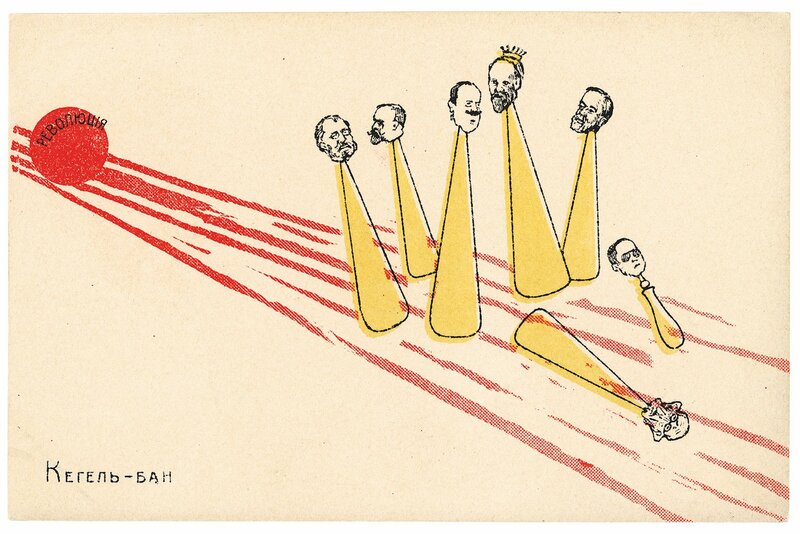 With the encouragement of local Social Democratic activists, Peschansky had consented to start reproducing Chemodanov’s drawings in postcard form, at last providing an outlet for the subversive political satires that he had been making throughout the year. The images were then sold across the city by an organised network of revolutionary helpers. 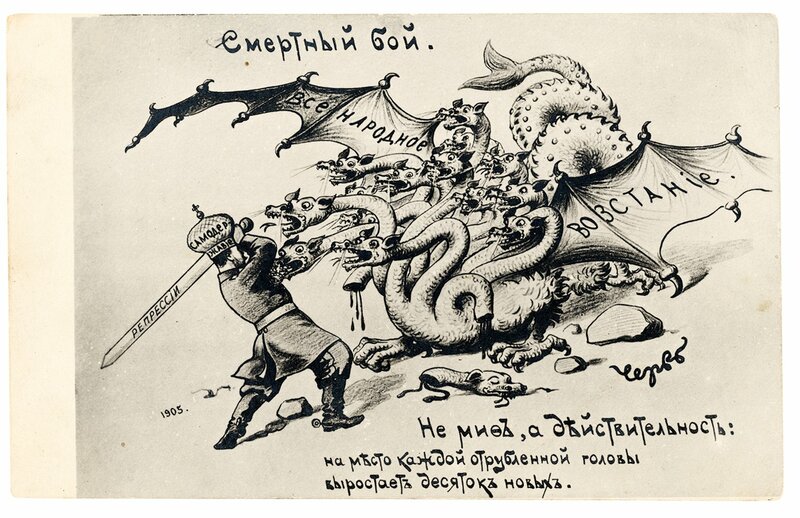 Three distributors of Chemodanov’s postcards had now been detained and a warrant for his arrest was duly issued. Chemodanov, however, was nowhere to be seen. In fact, he was not even in Moscow, but in Yalta. A couple of years previously, he had developed chronic bronchitis, a legacy of his days as a country doctor. In a bid to improve his health, he had gone south for a few weeks to enjoy the warmer climate. Wisely, he had not informed anyone where he was going. Over the previous 18 months, Russia had experienced an unprecedented period of strikes, demonstrations, and political violence. The unrest, which had been triggered by a government massacre of petitioning workers, had culminated later that year with a general strike, which forced the government into granting concessions, among them the promise of a legislative assembly and nominal press freedom. These reforms, however, did little to placate the population, and in December 1905 there was a full-blooded uprising in Moscow. Only after its brutal suppression did the tide begin to turn, and in the months that followed, the autocratic state set about reasserting its grip. 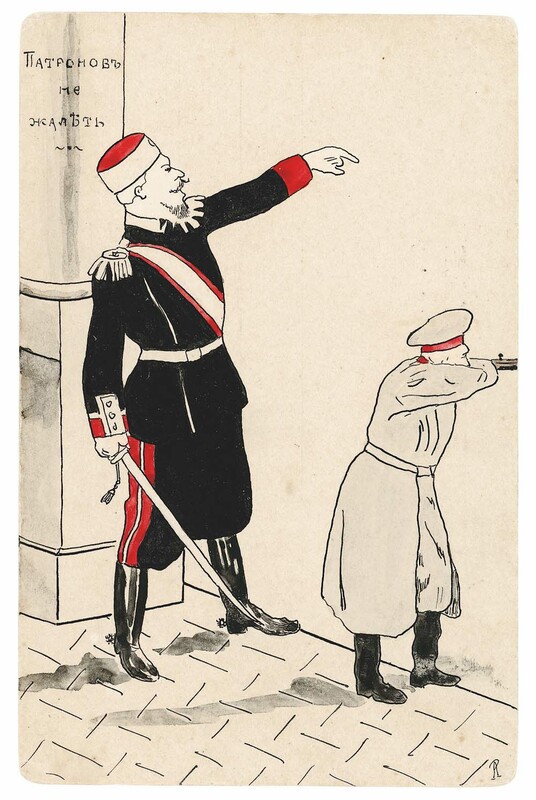 Chemodanov left Moscow again in the autumn of 1906, this time for the Caucasus. On his return in October the atmosphere in the city had become noticeably more stifled and he now began to sound “notes of alarm” in his conversations. Earlier the previous month, lead-distributor Nikolai Druzhinin had been caught attending a revolutionary meeting. The police had searched Druzhinin’s flat and subsequently put him under official surveillance. Another of Chemodanov’s distributors, a twenty-year-old hereditary noble named Boris Yevreinov had also been detained. More seriously, he was found with Social Democratic Party documents, several packets of postcards, and a letter addressed to Chemodanov containing compromising information. As the nights were drawing in, the noose was tightening and Chemodanov was right to be feeling nervous. A few days after his return, the Moscow Administration of Gendarmes had sent a secret communiqué to the Okhrana asking for instructions on carrying out a search of his flat. 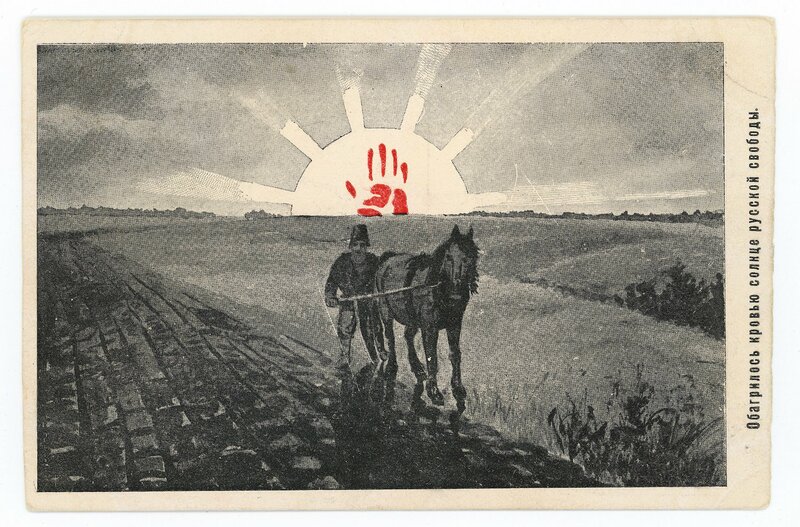 On 11 November, the Okhrana sent out an alert to all policemen in Moscow, demanding that they make the “most strenuous efforts” to detain the distributors of his postcards. The police in turn gathered together the city’s janitors and ordered them to keep a look out for anyone seen carrying large quantities of letters. On 1 December, a janitor noticed a woman loitering suspiciously near a block of flats in the south-west of the city. Seeing that she was carrying a small package, he hailed a local policeman, and together they detained the woman, who was later identified as a teacher and former peasant from Smolensk named Aleksandra Petrova. She was found to be carrying sixteen packets of postcards, all containing receipts signed by Chemodanov. Armed with this new evidence, the police returned to Chemodanov’s flat, and late on 3 December he was finally arrested. Other members of the network were soon rounded up. Irina Zelentsova, a seamstress from Kazan, and Anna Romanova, a home tutor, were captured that same day during an operation against a cell of Socialist-Revolutionaries. Hidden inside a linen basket in their Moscow flat, the police found two envelopes containing postcards, and nineteen other loose bundles, each wrapped with a signed receipt. In Zelentsova’s bedroom were several items of revolutionary propaganda, a box of revolver cartridges, and yet more postcards. 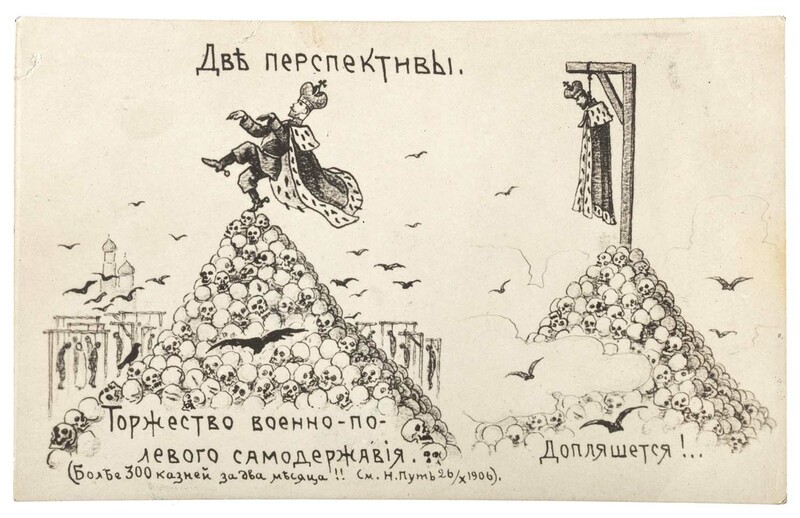 Among the latter, the police made a particular note of Two Perspectives, Chemodanov’s last and most subversive image, which predicted the Tsar’s death at the hands of the people. It was January before the police realised that Zelentsova was a pseudonym. The woman they had arrested was none other than Antonina Romanova, Anna’s sister, who had first been detained in connection with Chemodanov’s postcards back in May 1906. Perhaps the greatest discovery, however, came with the re-arrest of Boris Yevreinov. During a search of his home, the police found: sixty envelopes containing postcards, 1,994 empty pre-addressed envelopes, 157 loose postcards, a packet of notes and letters, 196 business cards belonging to various individuals, and 819 receipts signed by Chemodanov. This was an enterprise carried out on a near-industrial scale. 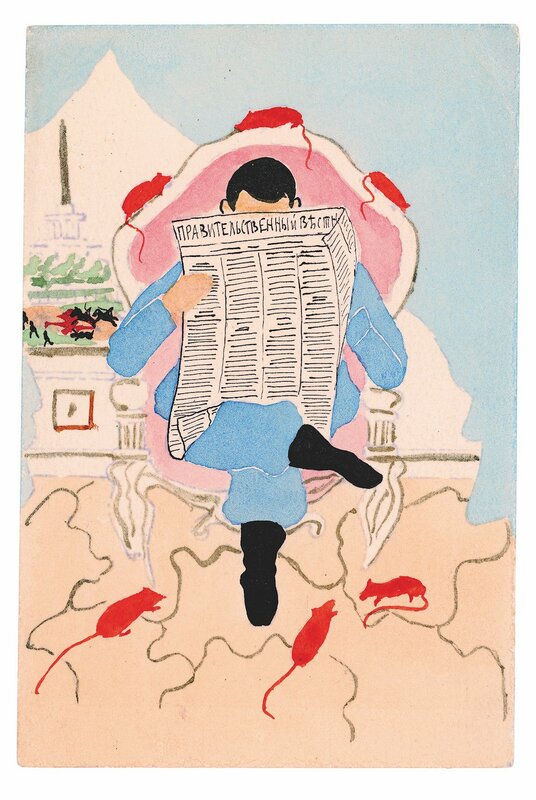 A week later, having received no reply, Chemodanov sent a follow-up telegram to report that he had developed pneumonia, and that his life was now in grave danger. The recipient’s copy bears a handwritten note from Stolypin’s office reading: “carry out immediately.” After a further few days’ delay, Chemodanov was released to await trial under conditions of police supervision. In a letter to his lawyer, Chemodanov expressed regret at the situation he now found himself in. “The pity is not for myself, but for others and for other reasons. I still have much left to do in the branch of medical research to which I dedicated the second part of my life.” Chemodanov continued to practice after his release, but his health had been fatally weakened, and he knew that he did not have long to live. In the final months of his life, he dispassionately recorded the progress of his illness in a small notebook, noting down the regularity of his coughing, temperature and lack of sleep. He died late in the evening of 16 January 1908. 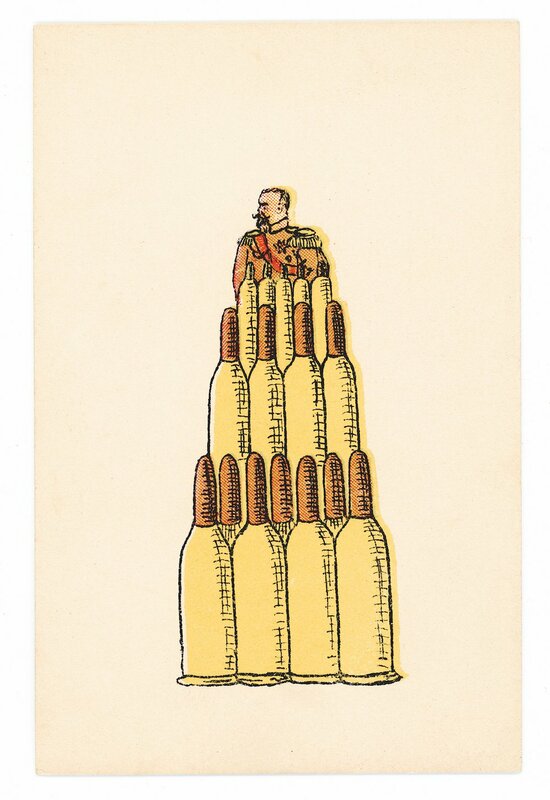 Tobie Mathew’s Greetings from the Barricades: Revolutionary Postcards in Imperial Russia is out now with Four Corners Books and can be purchased here.